Hello there and thank you for stopping by today. Today is the first day of the MFT November Release Countdown. Only 5 days until the new release (yay)! Be sure to head over to the MFT Blog for full set and die reveals for the day. This release is packed full of gorgeous new products that I have SO enjoyed creating with. 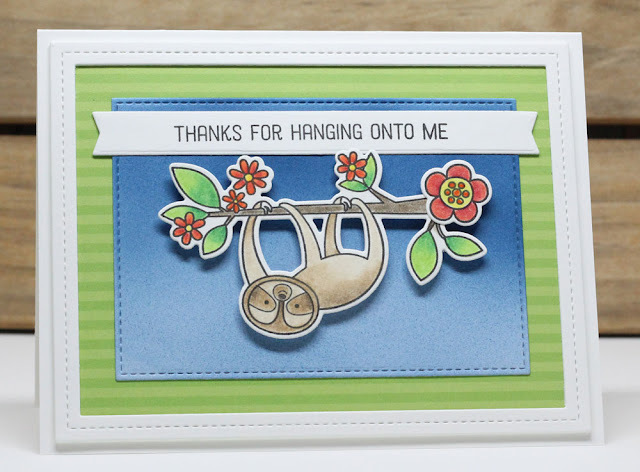 My first card today features the new Sweet Sloth stamp set and Die-namics. Oh my GOODNESS is this set ever cute. I couldn't put it down once I started stamping with it! I die cut and stamped the sloth and colored with with Prismacolor Pencils. The background was airbrushed with my Copic airbrush. These products and many more will be available for purchase in just 5 days, on November 1 at 10 PM EST. Be sure to check out the MFT Blog to see what the rest of the team has come up with today. Such a sweet card. Love the frame around the patterned paper. Great sentiment for such a cute design. Cute, cute card. Love your sentiment. Sweet card, Jody! Thanks for sharing.